Full frame shot... White Foam core board below and behind. Lots of lights. Shot in RAW, adjusted Levels and Curves on the high side. wow, excellent shot. I think it would be nicer to have the little guy in the foreground completely in focus--but not sure if that was possible. I love the colors and the composition otherwise. Fantastic. Cool shot. very creative and well executed as well. I would like to see just a little more of the guy inside the shoe. Good delivery with good color and humor. Congratulations on your top ten finish. I never got a chance to vote on this image but oh! wow is is good. Congrats on the top 10. Very creative and catchy shot - congrats on your top 10 finish! very creative, I like this shot! Very cool. Those little figurines are quite expressive. Nice job. Enjoyed the humor and the image is spot on. Nice Work. Wow! No one can say this is too drab! lol.Really great humourous idea! Really like the distorted shadow under the shoe, it helps add to the little men. Good job!! 8 - I might have gone higher but the back shoe looks a bit over-exposed / over-saturated on my system. Very nice and cool setup. I see someone's had some fun! Good lighting, the shadows might be softer. 9. Great idea, and the focus is great. I like the colors and it's interesting overall. (Never seen that kind of shoe before) Nice job. Magnet buddys. Very creative and nice placement as well as focus. This picture looks like it could be in an ad. 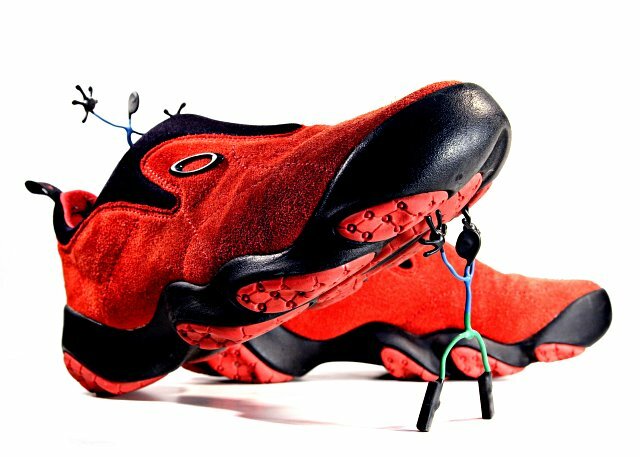 Are these oakley shoes? I like the white background and how the people are in the picture too. I am not really a big fan of the harsh lighting but you just barely pull it off but other than that I like this shot, those little blue/green men are funny and nice composition. 7 from me. Shoe looks very real...just want to reach out and touch it. Proudly hosted by Sargasso Networks. Current Server Time: 04/20/2019 04:12:53 PM EDT.